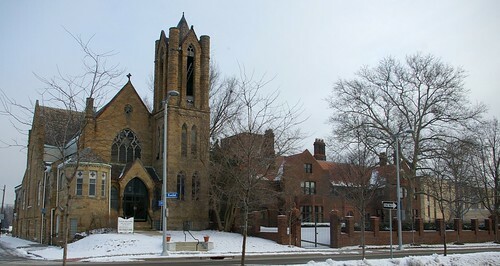 This church, at 8601 Euclid Avenue, is threatened with demolition. 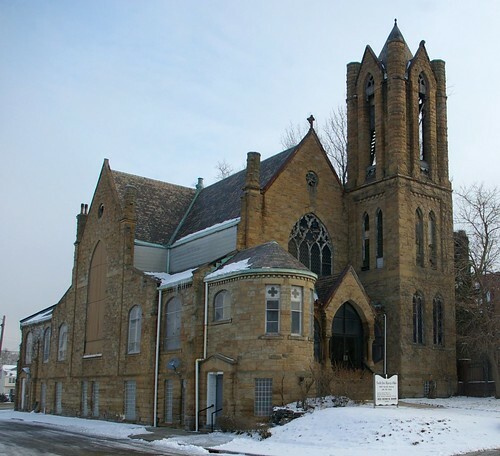 The congregation has been offered an unspecified sum by the Cleveland Clinic in return for demolishing the structure, a Cleveland Landmark, and providing the Clinic with a vacant lot. The Francis Drury mansion, at 8615 Euclid Avenue, was built in 1910-1912. It was designed by Meade & Hamilton, architects, and is one of but a handful of the remaining structures built on this magnificent boulevard. It is quite telling of the time that someone would be willing to build a house of this scale so close to an existing structure. The interior of the church is just as impressive as the exterior. Note the beautiful woodwork, especially on the ceiling. The sanctuary is lined with stained glass windows. It's a beautiful building, one that would be difficult to argue in favor of demolishing. Yes, it needs work - but that's the most often used excuse in the book. The cost of everything that ought to be done might even exceed the means of the congregation. Cleveland's population has declined with the growth of the suburbs. As we've left to these outlying areas for our various reasons, we've avoided the issues facing the city, leaving them for others. It's not enough for us now to merely "care" about the fate of these historic structures - we must make up for our years of neglect. The arrangement between Temple Tifereth-Israel and CWRU might be taken as a good example of one way this might be accomplished. The argument of the need for land adjacent to the Drury mansion rings hollow as well. Save for the church and the mansion, the entire block, all the way from Euclid to Chester, is vacant. In addition to the beauty of this building, is is important as a fragment of the history of Euclid Avenue and the context it provides. With its demolition, the Francis Drury mansion will lose a significant bit of context, and the city, a significant landmark. I think a larger question is, why is the Cleveland Clinc spending its money to destroy history and create vacant inner city lots when it should be using that money to treat people who otherwise might not be able to afford healthcare. The Cleveland Clinic has an abysmal record of detroying Clevland history. Has the Cleveland Restoration Society tried to engage them, and if not, why? The Cleveland Clinic once again rears its ugly side. Why not rename Euclide Ave "Clinc Blvd" since they've already demolished enough history already. 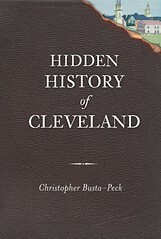 The sad fact is that Cleveland is at the mercy of teh Clinic - aside from government, the Clinic has the largest payroll in Cuyahoga County, and it is the only business that has grown continually over the last hundred years. I was pastor there for 4 years, 2003 - 2007. The building is in terrible shape. The safety of the congregation is a stake as the buildings foundation is made of sand stone and is not in good repair. I agreed to a sale in part with sufficient money to relocate, however, many in the congregation were against the move. If not repaired the building will fall soon. 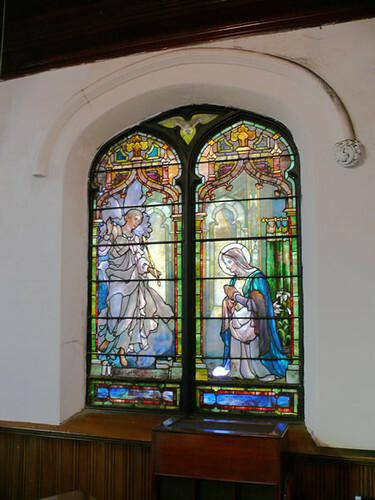 And no one has come forth with the necessary funds to repair the damage, and to this date many of the windows, including the largest stained glass window, remain boarded up. I was curious about the pipe organ inside. Is it in bad shape as well? I just learned yesterday...my birth mother (whom I've never met)listed her mailing address as 8615 Euclid in Cleveland in 1960. Her maiden (current?) name is Joyce Thelma Klein. Any comments/facts from anyone would be interesting. The mansion used to be The Florence Crittendon Home for Unwed Mother's back in the 60's. I was there in '63. Many babies lived because of that wonderful place. When I retire, I plan on purchasing an old abandoned church, and converting the building into a musical complex. 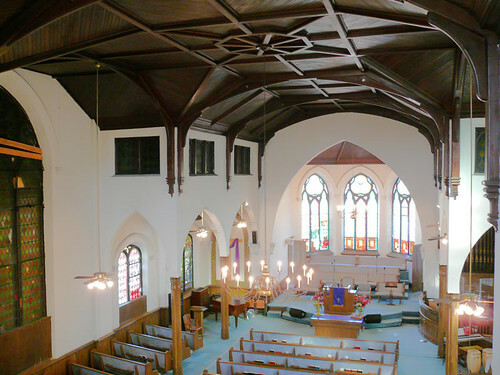 I would like to turn the sanctuary into a concert hall, and other areas into recording spaces and rehearsal rooms. I would like to hold free weekly concerts for the community, and then bring in professional bands to perform. The space could also be rented out for parties or lectures. This church is a prime example of what I would like to do.